The future of Hungary’s main leftwing opposition newspaper is in doubt following an announcement that it is likely to be sold. Journalists working for Népszabadság found themselves locked out on Sunday after staging a protest the previous day in response to the sudden closure of the daily paper. After talks with the management, the Editor-in-chief Andras Muranyi implied the decision was political. Mediaworks, which gained total control of Népszabadság last year after buying out the Socialist party’s 27.7% stake, said the decision had been driven by plummeting sales and losses amounting to 5bn Hungarian florints over the past decade. The ruling Fidesz party has described the closure as a “reasonable business decision”, but journalists have dismissed the explanation as a smokescreen – pointing out that it has come just days after the paper disclosed corruption allegations against a minister in Orbán’s Fidesz party and a scandal embroiling the governor of the national bank. Népszabadság had also criticised last Sunday’s referendum aimed at demonstrating public opposition to proposals to disperse refugees around EU member states, which overwhelmingly came out in favour of Orbán’s position but on too low a turnout to be valid. Even the far-right Jobbik party said the suspension was driven by politics. 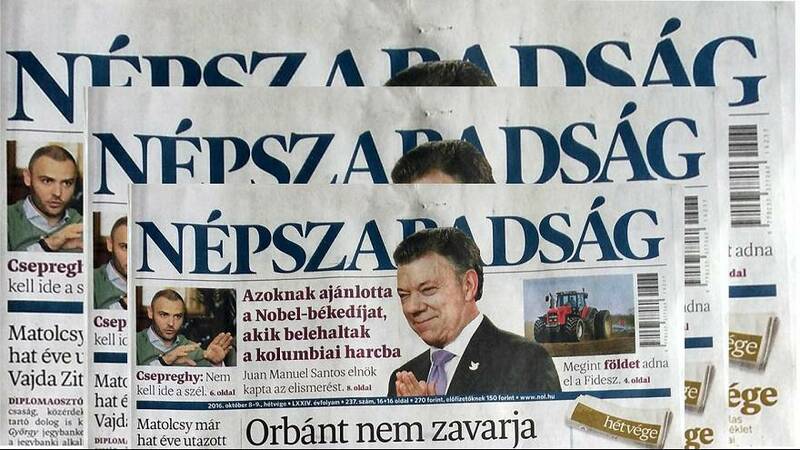 “The total undermining of Népszabadság is the latest example of Viktor’s Orbán’s megalomania. The only aim of Fidesz is to either gain 100% control over Hungarian media or to obstruct it,” said a spokesman. Established in 1956, Népszabadság was controlled by the ruling communist regime until its collapse in 1989. The paper’s most recent sales figures were about 40,000, down from 270,000 two decades ago. Reporting for euronews, Andrea Hajagos said it was unclear if and when the next edition of the newspaper would be published.